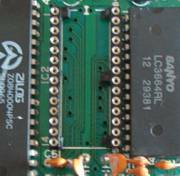 The BIOS can be replaced with an EPROM to enable use of different BIOS types. 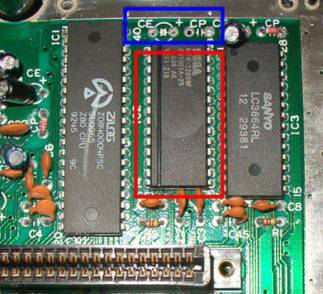 SMS consoles with US/European BIOS v1.3 use a Sony CXK3864 mask ROM, which is pin compatible with a standard 27C64 (8Kx8) EPROM. Here is a more detailed explanation using flash ROM. We can use any 32Kb ROM as a BIOS (probably, up to 48Kb is fine). Desolder the original BIOS chip, which isn't writable. In red, the BIOS chip. In the blue area, there were two capacitors that you will have to remove. The system will work fine without them. I will detail how to use a 29F0x0 flash ROM. A 29F010 is the best part you can get in my opinion; it's a 128kbytes, 8 bit Flash chip, and requires less wiring than higher capacity models. Solder a 28 pin socket. 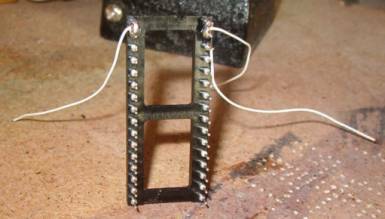 The modifications needed to match the pinout can be made on a 32 pin socket that sits on top of the 28 pin one. This way there's no need to do anything on the motherboard or the memory chip, which can be easily pulled off for reprogramming. Modify the 32 pin socket. 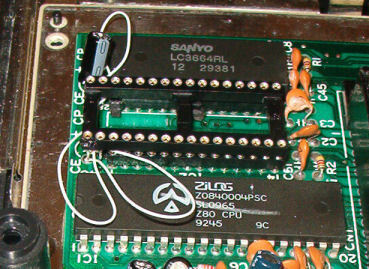 Obviously, the 32 pin socket is bigger than the original chip, and that's why you will need to remove the 2 capacitors shown in the above image. If you use a 29F010 then it is easy to make pinout compatible. 29F020 or 29F040 will need some more wiring, to ground extra address lines, but that is not a big deal. You will have to connect Flash ROM /WE and Vcc together to 5V, taken from any place on the mainboard. Connect A15, A16 and A17 to ground. If your Flash ROM chip has more address lines, tie them to ground too. I did these modifications on the 32 pin socket. Apart from these pins I mentioned, the rest of the board pinout matches exactly a 29F0x0 flash ROM. Black pads are ground points. Red pads are 5V points. If you disabled BIOS, you need to undo the modification for the BIOS to be able to boot again at start-up (else, cartridge will boot first). 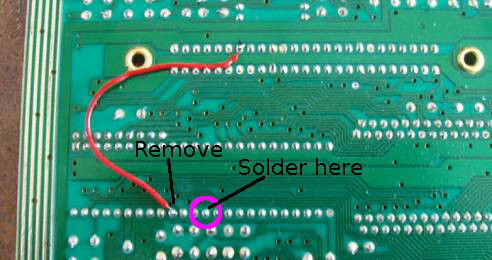 This can be very easily done by desoldering the cable that connect cartridge pin #13 (/CE) to pin #36 (/CE0) of I/O chip. You will only need to desolder the I/O chip end; the cartridge end of the cable remains the same as it should already be.